Crazy, Courageous or Both - Day 3! Wednesday was day 3, from Amarillo Texas to Williams Arizona. We had a bit more time to stop at sights, and more interesting places to see! After a decent breakfast at the creepy hotel (the Taco Bell in 15 feet from our room door didn’t serve breakfast :( ), we set off west again. Caitie slept well in her suitcase-bed by the way! 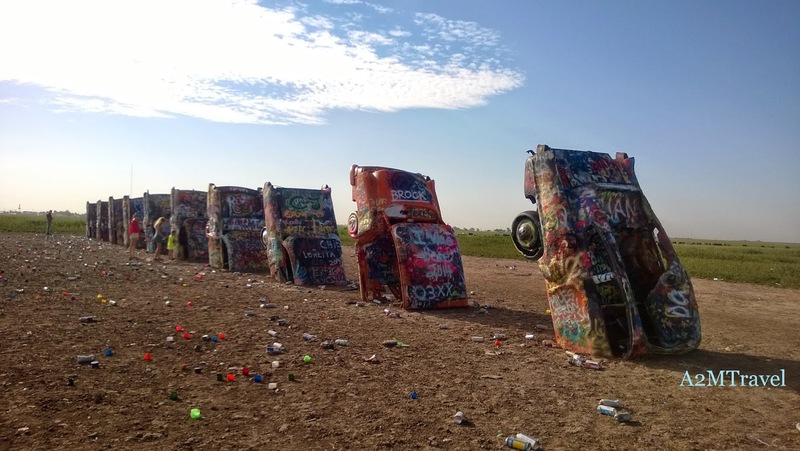 Our first stop was Cadillac Ranch just west of Amarillo (exit 60 off Interstate 40... you can see it from the highway on Route 66) The story is- a billionaire named Stanley Marsh wanted to mess with the minds of the locals, and had the 10 Cadillacs brought in and buried nose down, so show off the tail fins. So, as tourists, we park along the side of the road, and walk into the field. There are cans of spray paint everywhere, so no need to buy your own to bring. We found a few colors and the kids went crazy with their graffiti. There was so much paint on the cars over the years, it was deep enough to carve into. We left our marks, took some pictures and set off again. around you. That found us a few cool towns along the way. 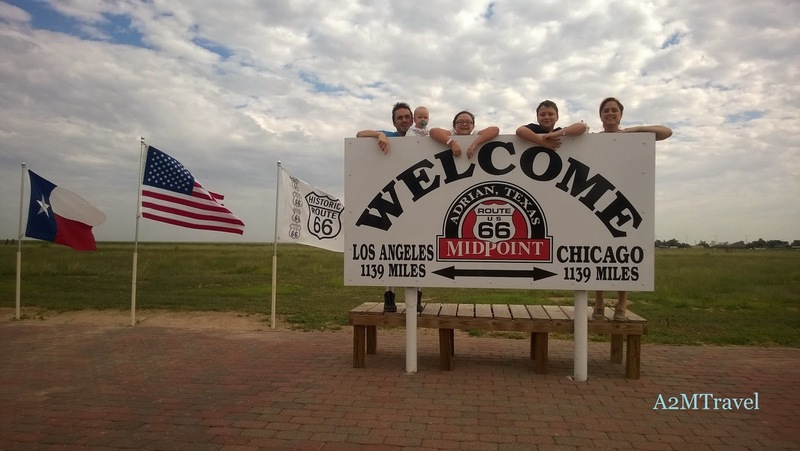 Historic Route 66 follows along Interstate 40, so in Adrian, Texas we pull off and find the Midpoint Café. As the name says, it is the midpoint between the Chicago and Los Angeles along Route 66…1139 miles both ways. There was a great little souvenir shop there, and some wonderful homemade pie! We got a few more state magnets to add to our map at home. The café has changed hands over the years, but is currently owned by a Tennessee native! Side note… wherever you are out west, always know how much gas you have! There are many areas that do not have working gas stations for miles! We are Almost speaking from experience here! 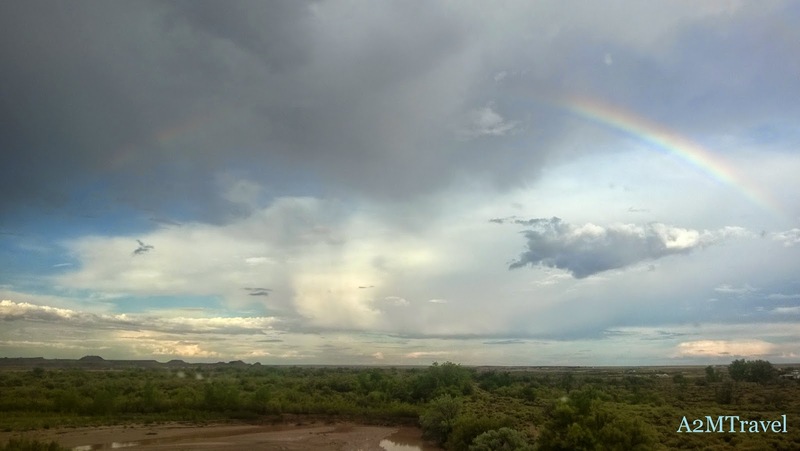 After we crossed into New Mexico, the ground gets much more…. Brown…. Smaller plants… much less of the green we are used to. Oh and a speed limit of 75! Nothing personal New Mexico, but we were just passing through! 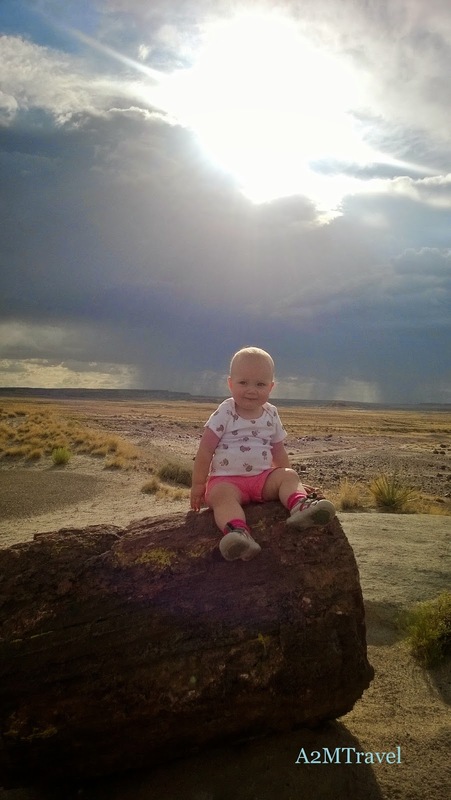 Arizona had a big spot we were looking forward to- The Petrified Forest! 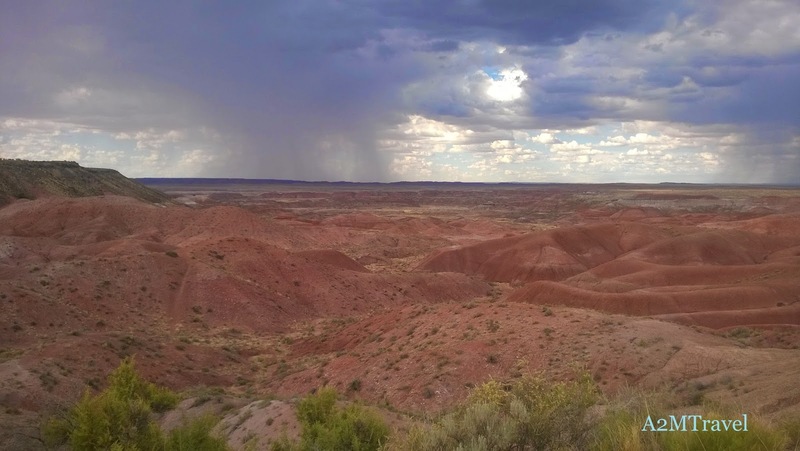 Not long after crossing the state line is this National Park in the middle of the Painted Desert. Quick stop at the visitor center for the stamp in our National Park Passport book, then off we go. It is a drive through park, with several beautiful stops along the road. The colors are exquisite! The reds layered with the white rock, green desert plants, against the clean clear blue sky was just Awesome! Truly a reflection of God’s Love for us to provide such beauty for us to enjoy! 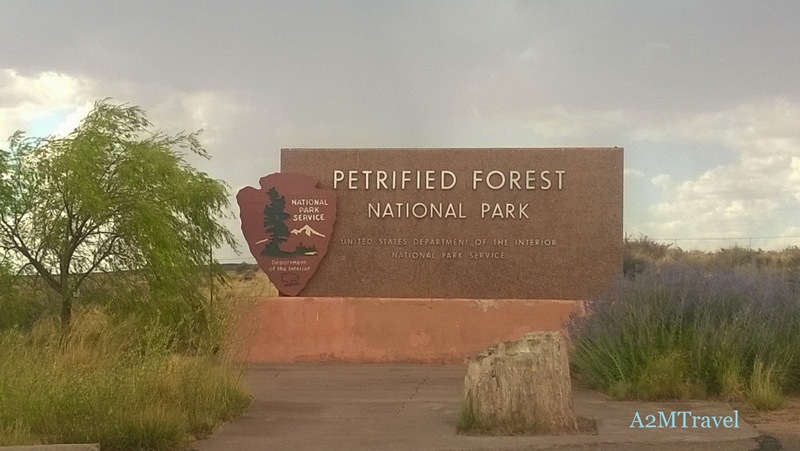 The petrified forest stops were fun with walkways through piles of stumps… doesn’t that sound exciting! They are stone now, probably turned that way from the heavy heat bearing down on us! Yes, a dry heat, but still HEAT!! Hubby decided to go for a jog around the path, quickly realizing the heat and elevation are tough competitors to mental and physical will.